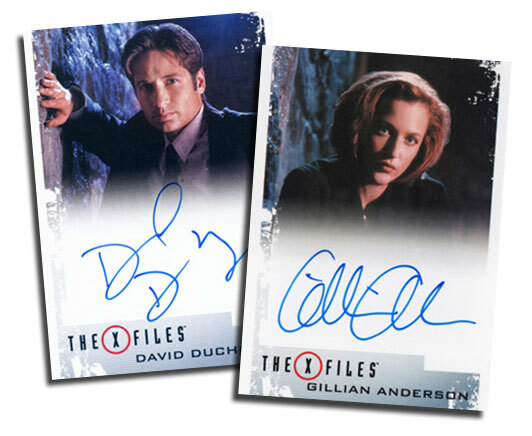 2019 Rittenhouse X-Files Archives Classic Autographs is a small but potent follow-up to 2018’s Seasons 10 and 11 set. The full checklist consists of just three autographs — including the two biggies — and nine Metal cards. However, it’s available in very small numbers and they’re priced on the high-end scale. Each pack has two of the three autographs plus three Metal cards. David Duchovny (Fox Mulder) and Gillian Anderson (Dana Scully), the show’s lead stars and sci-fi icons, are two of the signers. 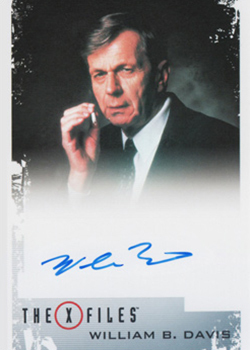 William B. Davis, who played Cigarette Smoking Man, is the third. According to Rittenhouse, the approximate print runs for each are as follows: Duchovny – 50 copies, Anderson – 100 copies, and Davis – 150 copies. That means right around 300 total autographs for the entire product’s run and 150 packs. The Metal cards revolve around the characters Mulder, Scully and Skinner. Each has three different cards, showcasing them in different phases of the show’s original run. Those who order three packs direct from Rittenhouse ($299.99 each) are guaranteed to get at least one of each of the three Autographs and a full set of nine Metal cards.